Info "Red food goes on red trays. Duh." 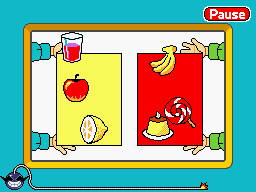 Food Colors (spelled Food Colours in the European version) is one of Ashley's microgames in WarioWare: D.I.Y. The point of the game is to sort the various food items by tray color. The two colors are red and yellow. The items in the yellow group include a banana, flan, and a lemon. The items in the red group are an apple, a lollipop, and a glass of red juice. The player needs to tap the object for it to go to its respective tray. Tapping the wrong object does not end the game in a loss. If the player manages to sort the items before time runs out, the game is won. However, if time runs out and all the items are not sorted, the game ends in a loss. This page was last edited on September 20, 2018, at 14:35.